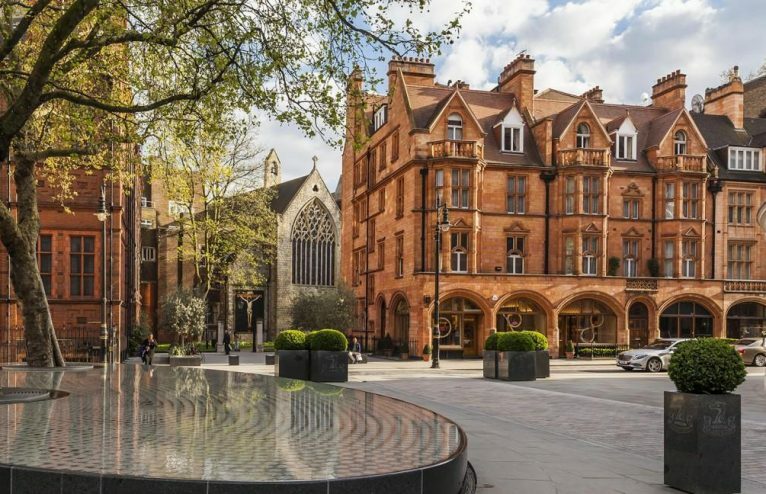 One of London’s swankiest neighbourhoods, Mayfair is home to some of the world’s most legendary hotels, exquisite Michelin starred restaurants, and seriously exclusive private members’ clubs. Its streets – lined with Georgian townhouses, esteemed galleries and majorly high-end stores – are certainly paved for the well-heeled. A favourite haunt of the privileged, get blissfully lost in the luxury with our Citizen Femme insider picks. Welcome to the most expensive square on the Monopoly board. For the CF guide to London Members' Clubs, have a look here. Spencer Tracy – one of Hollywood’s major Golden Age stars – once said, “When I die, I don’t want to go to heaven. I want to go to Claridge’s.” Why wait, we say! Decades on, Claridge’s is still a firm favourite amongst visiting celebrities, royalty – real and Hollywood – and heads of state. In fact, it’s a total icon. A timeless landmark in a historic city. In all of its elegance and opulence, Claridge’s is a portal to old-world London; one we want to step through again and again. Another of London’s greatest, The Connaught is chicer than chic. And so deliciously low-key about it too. Sitting pretty in “Mayfair Village”, The Connaught is British luxury at its finest – traditional-meets-contemporary design, flawless and genuine service, irresistible charm, fine dining in the way of a two starred Michelin… we could go on. Underground and tucked away is the uber-sleek, all-black-granite Aman Spa – don’t miss it. Even non-guests can stop in for a complimentary midday meditation session (prior booking required). A bold, artistic mish-mash of spaces spread over two floors, Sketch comes complete with three lounges for tea and cocktails and two restaurants. There’s the Michelin starred Lecture Room and the Insta-famous plush pink Gallery, or for cocktails and nibbles, East Bar and the Glade are your picks. Dress code? Art Smart, of course. Tiny eaterie on Dover Street, get a real sense of the flavours of the Italian Riviera. A spin-off from the yachtwear shop next door, the interior of Chuc’s continues the yacht theme with staff wearing nautical uniforms, right down to gold-braided epaulettes, while photographs of the picturesque port of Positano and other gilded holiday destinations adorn the walls. You’ll feast on an excellent seafood tagliolini, studded with baby clams, tender octopus and freshly-made pasta and some of the best paper thin pizza in London. This is the flagship store, or “London home” for Dunhill. Bourdon House is an homage to the ease and luxury to which Dunhill devoted himself. And while it is a a one-stop shop for the modern gentleman and a private members’ section, if the sun is shining, take a seat in the front courtyard and sit next to one of London’s listed trees, predating the building itself, for a cup of coffee, fresh juice or a chilled glass of rosé. A place of work and play for the fashionable and fabulous, you’d think it’d be easy to find a solid coffee spot in Mayfair. Surprisingly though, Fernandez & Wells is one of very few. Go for breakfast, sandwiches, or an afternoon pit-stop featuring yummy baked goods and some smooooth caffeine. If its hydration you are after, head downstairs at 32 Dover Street, after you have shopped at Wolf & Badger, and grab one of their daily-squeezed, cold-pressed organic vegetable and fruit juices, served in recyclable glass bottles. There is also an extensive breakfast menu, tea and coffee, snacks (including gluten-free and dairy-free), healthy salads and a selection of fresh sandwiches. It’s a great place to stop and check your emails at the same time. Voted World’s Best Cocktail Bar in the 2016 Spirited Awards, the Connaught Bar is king. It’s ultra-stylish and definitely innovative when it comes to its concoctions. A menu of “Masterpieces” and “Expressions”, cocktails are inspired in both classics and the globetrotting bar team’s far-flung travels. Go for something clever or beckon over their bespoke martini trolley. For Citizen Femme's pick of lunch and dinner spots in Mayfair, take a look here. A stroll – or strut – down Bond Street is our kind of morning walk. Here, you’ll find every designer boutique under the sun, from the world’s most prestigious to upcoming independents. Jigsaw’s flagship concept store, Duke Street Emporium is a kind of style-meets-culture space. Also housing the Shop at Bluebird and beloved coffee shop Fernandez & Wells, you can have a little piece of Chelsea and a sip of Soho without leaving Mayfair. For some very British fashion (in a timeless, luxury way), yummy beauty products and a fine collection of curated books and arts, it’s well worth popping in. If not for the shopping then for a cup of London’s favourite Joe. An essential stop for trendsetting Femmes, Wolf & Badger is the go-to if you want to pick up some hot new pieces by some hot new designers. The boutique stocks some sweet emerging talent that you’ll want to have in your wardrobe before anybody else. And of course there is Raw Press downstairs! Effectively a glamourous runway of old-world fabulousness, Burlington Arcade is everything you could ever want from Mayfair. Sashay your way down the arcade admiring the diamonds and eyeing up the Ladurée macarons; this is what shopping centres must have looked like 200 years ago. Except now you have the addition of cashmere scarves, to Vilebrequin, Penhaligon’s to Patrick Macros. With all its charm, who could resist the urge to splurge? This is the ultimate destination for keep in your kitchen goodies that are truly British. Hampers and famous teas and coffees are the things you must pick, and although it has grown to include beauty products and accessories, you will also find champagne jellies, buttery biscuits, preserves and so much more. This is where you go for gifting, for your home, and someone else’s. It is, after all, where the Queen does her groceries. There’s practically a gallery on every block in Mayfair, with the Royal Academy at the epicentre of the neighbourhood’s art scene. Visit for their Summer Exhibition, an annual event for the last 250 years which shows off works from around the globe and offers a first look at future art-world trends. Another biggie is the Gagosian, one of the best established galleries in the world. Of the many many other private Mayfair galleries to choose from, our top CF picks would be Sprüth Magers and Michael Werner. For more CF Gallery picks, take a look here. Synonymous with men’s style, Savile Row isn’t a particularly femme-friendly shopping destination. But, it’s surely worth a quick visit in the name of history and tradition. Plus, it’s not all tailors and tweed. Once home to the Royal Geographical Society where British explorations to Asia, Africa and the South Pole where planned, there’s a whiff of adventure in the air too…You can always stop at the swanky Cecconi’s on the way for a glass of champagne and some tiramisu. A charming little 18th century square, Shepherd Market feels like a village right at the heart of London’s most exclusive neighbourhood. The infamous fair that once took place here is in fact how Mayfair came to earn its name. Take your time to explore the side streets – they’re packed with cute boutiques, eateries, impressive Victorian pubs, and this being Mayfair, plenty of galleries too.